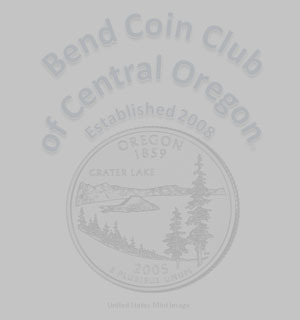 The Bend Coin Club of Central Oregon (BCCOCO) is a vibrant local coin club serving the Central Oregon region, including the cities of Bend and Redmond. The BCCOCO was founded in 2008, and welcomes all numismatists — persons who study, collect, or deal with coins, paper money, tokens and medals. The BCCOCO is proud to present bendcoinclub.org, our home on the World Wide Web! This site is updated at least monthly to bring you accurate and up-to-date information about numismatics in the region. BCCOCO members are also available to help answer your questions about numismatics. Please don't hesitate to ask us a question or to contribute information for possible use on this site! The following companies or businesses have donated prizes for use at monthly club meetings. Thank you! In memoriam - Michael Graham, owner of Mountain High Coins, passed away June 2015. The shop is still active. See "Current and Upcoming Club Events" below, see our calendar and see the president's message. NEW Bend Meeting Location! - See below, or see the calendar page. Reminder - Meeting Dates and Locations! The BCCOCO meets alternate months in Redmond and Bend, except as noted. See our calendar (or the information below) for complete details. Meetings, which had been held on the 3rd Tuesday, moved to the 2nd Tueday beginning in February 2016, unless otherwise announced. Driving directions are posted on our calendar page. There are no club meetings in July or August. Also see the president's message. Welcome! If you're new to numismatics or the club, or just looking for more information, welcome ... perhaps club members can help you learn more about what you've got, or help you enjoy collecting more. See below for more information about the club and its upcoming meetings and events. See the links page for some recommended websites. What's your silver and gold worth? To find out, try the "Online Precious Metal Weight Conversion and Melt Value Calculators" at http://www.silverrecyclers.com/. Coin Conventions! BCCOCO members and guests are invited to attend the annual PNNA conventions in the Seattle and Portland areas. See our own calendar or the PNNA website for more information. See previous BCCOCO news headlines (2018 and earlier). Website! This website was first published on May 13, 2010. Please let Eric Holcomb know if you have suggestions, corrections, etc. We could use more club member content! What is our charter? — Per the BCCOCO constitution, "The purpose of this organization shall be to study and support the hobby of numismatics; to promote numismatic-related educational activities; to disseminate numismatic knowledge through regular meetings." In doing so, the BCCOCO contributes to the mission of the Pacific Northwest Numismatic Association (PNNA) to "promote, extend, and protect the interests of numismatists and numismatic activities throughout the Pacific Northwest and to foster and encourage the study of numismatics in all its forms." What do we do? — In addition to maintaining this web site, the BCCOCO plans to publish a monthly newsletter, has monthly meetings, and promotes numismatics thrugh special programs, activities and awards. Our BCCOCO information index includes links to everything you need to know about the BCCOCO! See the PNNA reference section for information about buying and selling coins, a list of speakers for your coin club meetings, and a variety of other numismatic topics. See the Young Numismatist (YN) activities page. Also see the BCCOCO calendar and the President's Message. BCCOCO Regular Monthly Meeting, Tuesday, May 14 at PatRick fire facility, 1199 NE Hemlock Avenue, Redmond, OR, at 6:30 p.m. (room opens at 6:00 p.m.). Program: to be announced. Also show & tell with random prize(s) to participants, plus an auction from about 8:00 to 8:30 p.m., or at end of meeting, if requested. BCCOCO Regular Monthly Meeting, Tuesday, June 11 at the community room (clubhouse) at Suntree Village, 1001 SE 15th St., Bend, OR, at 6:30 p.m. (room opens at 6:00 p.m.). Program: to be announced. Also show & tell with random prize(s) to participants, plus an auction from about 8:00 to 8:30 p.m., or at end of meeting, if requested. The April 9, 2019 club meeting in Bend featured ANA National Coin Week and the ANA's annual 15-question club trivia quiz. Paul will attempt to gather and submit all the correct answers! There was also the usual show & tell and auction. The March meeting was moved due to possibility of other activities at the Redmond facility. The March 12, 2019 club meeting in Bend featured a brief preview of the Tukwila PNNA spring convention, including especially the collector exhibiting and judging seminar in the numismatic theater. There was also the usual show & tell and auction. The February meeting was postponed one week due to weather. The February 19, 2019 club meeting in Bend feature a short illustrated program given by Eric H. on "British Conder (not Condor!) Tokens," along with the usual show & tell and auction. The January 8, 2019 club meeting in Redmond featured a sale of some older numismatic books, the usual raffle and auction, and election of 2019 club officers. The December 4, 2018 club meeting in Redmond featured the annual Christmas/holiday potluck, and was one week earlier than normal. There were excellent raffle prizes, including a proof one-ounce silver Eagle, and a proof 1/10-ounce gold Eagle, from the U.S. Mint. There was also good participation in the monthly "show & tell." Please join us again next year! At the November 13, 2018 club meeting in Bend, Eric re-presented the talk he first gave back in 2015 on "So-Called Dollars," adding a display of the new book So-Called Dollars from the Pacific Coast Expositions, 1894-1962, by Shevlin and Hyder. At the October 9, 2018 club meeting in Redmond, Paul was scheduled to give an illustrated presentation on "U.S. Mint Native American Code Talker medals," but was unable to attend, so Keith presented some of the material and showed an album with some of the medals. Photos: 2001 U.S. Silver Eagle colorized with "Defenders of Freedom" design. See more "Show & Tell" (or prize) items. The September 11, 2018 club meeting in Bend was an opportunity to report on summer numismatic activities, including the ANA convention in Philadelphia. Photos: 2005-S Sacagawea Dollar (PR 69 DCAM). See more "Show & Tell" items. The June 12, 2018 club meeting program in Bend was given by former club president Ted Campbell, who spoke about his experiences buying coins and getting great deals on GreatCollections.com. He also had a few coins to show us. The May 8, 2018 club meeting in Redmond featured a brief review of information about U.S. coins that can be found in the "Mega Red" edition of the "Red Book," plus a few more special auction items of U.S. coins including proof sets from 1957 to 1964. The BCCOCO ANA Club Representative is Eric Holcomb.